The above charts represent prevalence rates, which is to say there are the numbers of individuals afflicted, diagnosed or under surveillance for a particular condition/ICD at the “Newborns/Young Children” age range. Without revealing the exact diseases or ICD identifications, the first condition to the left is one which occurs primarily right after birth, and decreases rapidly with time soon after birth. 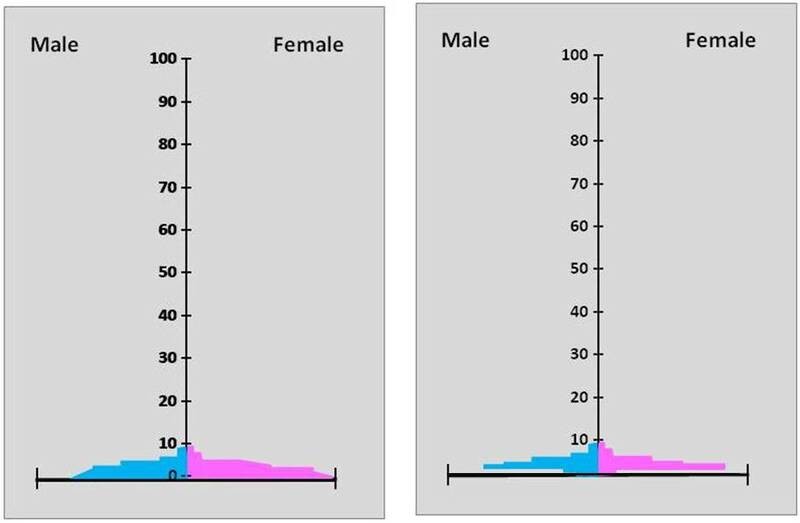 Notice there is a slight rise in prevalence in the females more than the males between 20 and 30 years of age as well. This tells us that such a condition does not only occur right after birth, but also rarely recurs in the older patient. The fact that it is rapidly reduced in rates by the time 3 years of age is reached suggests this has something to do with environmental exposure. It could be a condition that ensues after environmental exposure such as an infection or infectious disease state, but one which is very rare to be seen in adults. The second condition is a typical childhood related infectious phenomenon. Its peak is at the 1-2 year period, reducing more quickly after 9 years of age, and then plateaus at very low levels in individuals between 20 and 45 years of age. This would be suggestive of a disease that is environmental and/or infectious based, with limited tendencies to develop a secondary peak in the younger adult years. In the case of an evironmental diseases, this means that the body in young adults has perhaps completely adapted to the disease related problem and its causes. For infectious diseases, this behavior would suggest that immunization either remains effective past the age of 18 and does not require some sort of revaccination, or whatever physiological, anatomical and other conditions that made the young child very susceptible no longer exist in the adult body, such as an immature immune system. We know this is a disease related solely to the surrounding settings since it does not peak at <1 years of age like the prior. Unlike the prior, which initiates immediately after birth, this requires some sort of human and/or environmental intervention for the condition to initiate its pathogenic process. This minor difference in the 0-2 year old age group counts is very important to better understanding the disease or medical condition and its cause and effect relationship with the human body and with people. The third condition is a genetically based condition which normally is diagnosed immediately after birth, and tends to have increased prevalences peaking at 8 years for males, 2 years for females. The reason for this difference is uncertain. Some human behavioral and environmental engagement processes are required for the condition to set in. Notice also the secondary peak in the male population at about 20-22 years of age. This suggests that there is a tendency either for the disease to become more likely to manifest in the early adult years, or for young adults to suddenly become more susceptible than they were during their teenage years, like when a childhood immunization wears off and requires revaccination, or this takes place due to a number of features involving lifestyle, physical body and environmental changes, and the effects these have on the genetic nature of the individual. In cases where genetics has the effect of lessening the survivability of a body, we would expect to see this sort of reduction in numbers begin to appear due to the mortality rates these conditions result in. Longevity for these individuals is lessened, with few surviving after 50 years of age. Also note, there is a small peak generated on the female side of this graph–this suggests that there is some sort of natural selection process possibly going on–these women are in their reproductive years, enabling the genetic trait to continue and express itself in the younger population. This is no doubt a very controversial type of behavior that will be seen to some extent in many genetically based diseases. While such cases illustrate the value of this way of looking at disease distributions across a large population, it also demonstrates the moral and ethical problems such analyses could result in. The fourth condition is a psychological behavior pattern that manifests itself quite soon after childbirth (>1 year of age), with female prevalence twice that of male for the 1-3 year olds, followed by two more prevalence peaks for females at 13-15 and 35-47 years of age approximately (again, reproductive years). There is a possibility that this is a biologically-based behavior change, but much of the evidence demonstrates it to be mostly of a behavioral nature. Any childhood cases manifested as neurobiological behaviors triggered by psychosomatic and possible endocrine causes are presumably treated effectively by 15 to 20 years of age, or the problem simply is outgrown and goes away. Also note that during the youngest and oldest childhood years, females outnumber or outbehave males in regard to prevalence status. There is a primary peak in prevalence at ages 2-3, another at 10-11, and a third at 37-42. Performing a statistical test would demonstrate the second peak to demonstrate gender-defined rate differences.